Proteases screening from several nontraditional plant sources is gaining relevance in research, medicine, and food processing due to their important roles in plant physiology, therapeutic and potential use in biotechnological processes. Citrus aurantium flower contains proteases in high concentration and its potential use as a new source of proteases for fish hydrolysate production was evaluated. The effect of pH (4, 7 and 9) and citrus proteases (CPs) concentration (2.5 and 5% E/S) on protein hydrolysis of tilapia muscle (Oreochromis sp.) was determined by SDSPAGE analysis. Different protein degradation patterns were observed at different pH. A non-specific higher protein degradation on fish muscle proteins was observed at pH 4, using 5.0% CPs concentration (E/S) at 50°C after 2 h of hydrolysis, generating low molecular weight (<10 kDa) peptides. At neutral pH, CPs hydrolyzed preferentially myofibrillar proteins (myosin and actin), releasing peptide fragments of approximately 31 and 10 kDa. Degradation protein pattern observed at pH 9, was less intense. The diverse degradation patterns observed for tilapia muscle protein under different hydrolysis conditions offer possibilities for the use of CPs from Citrus aurantium flower for the production of protein hydrolysates to be used as functional ingredients and/or bioactive peptides. Bioactive peptides, Azahar, Protein hydrolysate, Peptidases, Plant proteases, Functional properties, Fish hydrolysates. Plants are a well-accepted food source for human and animal nutrition. Nowadays more non-traditional plant sources are included in our diet due to the valuable content of essential nutrients that provides health benefits when consumed. Additionally, the presence of functional molecules, such as enzymes, can be isolated and used as processing aids in biotechnological processes [1-4]. In plants, as in all organisms, different enzymes occur naturally, playing important roles in different biological processes. Some parts of plants (e.g., leaves, flowers, roots, seeds and fruits) contain proteases in high concentration and the screening for their presence in new plant sources is gaining relevance in research, medicine and food industry . Proteases have been used as processing aids in several industrial processes, representing nowadays more than 60% of the enzymes global sales . The most common applications of proteases in food processing include cheese production, meat tenderization, and protein hydrolysates production. Proteins hydrolysis by enzymatic processes has been considered a promising method for the modification or enhancement of functional properties of food proteins, such solubility, emulsifying, foaming, etc. .
Several fish species such as salmon (Salmo salar), Pacific whiting (Merluccius products), mackerel (Scomber austriasicus) and tilapia (Oreochromis sp.) have been used for the production of protein hydrolysates with functional or bioactive properties [7-9]. Protein hydrolysis by enzymatic methods involves the selection of several conditions such as type of enzyme, enzyme/substrate (E/S) ratio, pH, temperature and degree of hydrolysis (DH). Besides, the type of protease used is one of the most important parameters that determine the properties of a hydrolysate and define its use as functional ingredient or bioactive compound. Commercial proteases commonly used in protein hydrolysate production include Alcalase, Flavourzyme, Neutrase and Protamex, which are produced mainly by the fermentation of selected strains of Aspergillus and Bacillus . Information related with the use of plant proteases for hydrolysate production is still scarce or limited to the use of papain, bromelain and ficin [9,10]. Previous research at our laboratory has reported that citrus plants represent a new source of proteases with potential use in biotechnological processes (e.g., protein hydrolysate production) . Hence, the objective of the present research was to evaluate the action of citrus proteases (CPs) extracted from Citrus aurantium flower over tilapia muscle protein under different hydrolytic conditions (pH and E/S ratio) by SDS-PAGE analysis in order to determine the potential use of CPs for fish protein hydrolysates production. Citrus flowers proteases (CPs) extract was obtained by blending one part of dry flowers, from sour orange tree (citrus aurantium) with 10 parts of cold buffer solution (Tris-HCl 0.02M, pH 7.0) (w/v) using an Oster blender model 450-10 (Sumbeam Mexicana SA de CV, Mexico). The homogenized was filtered using cheese-cloth and centrifuged at 7000 × g per 30 min at 4°C using a table centrifuge model D-375 (Thermo Fisher Scientific Inc, Germany). The CPs extract was keep in refrigeration (4°C) and use on the same day. The protein content in the CPs extract was determined using the DC Protein Assay kit (Biorad Laboratories, Hercules, CA). Absorbance at 590 nm was recorded using an OPSYS MR microplate reader (DYNEX Technologies, USA) and bovine serum albumin (BSA) as standard. Proteolytic activity was determined by the method of Kunitz  using bovine serum albumin (BSA), hemoglobin, casein, azocasein and azoalbumin as substrate. Briefly, 450 μL of 1 g/100 μL protein substrate solution (100 mmol/L Phosphate buffer, pH 7.0 or 50 mmol/L sodium acetate, pH 4.0) was mixed with 50 μL of flower extract and incubated at 50°C for 60 min. After incubation, the reaction was stopped by the addition of 500 μL of 50 g/L tri- chloroacetic acid (TCA). Control samples were prepared in the same way but with TCA added before incubation and kept on ice for the same period. The mixture was vortexed (Mini VortexMV 1), left to stand on ice for 30 min and centrifuged at 20,800xg for 20 min using a model 5417R Eppendorf centrifuge. The optical density (OD) was measured at 280 nm (or 440 nm for azoproteins) using a Cary 50Bio spectrophotometer (Varian, Palo Alto, CA, USA). One unit of enzyme activity (U) was defined as the amount of protein that increased the absorbance by one unit under the described conditions. Tilapia (Oreochromis sp.) was obtained as individually vacuum-sealed frozen fillets from a local fish market. Thawed fillets were minced and homogenized with a volume (w/v) of deionized water at 95°C. Homogenized muscle was kept at 95°C for 15 min in order to inactivate endogenous fish muscle proteases. Then, sample was cooled off by immersion in icy water. Samples were adjusted at pH 4.0, 7.0 and 9.0 with 2M HCl or NaOH, accordingly. Samples were heated up to 50°C and CPs extract added to a final concentration of 2.5 or 5.0% (E/S) for protein hydrolysis. In order to monitor the hydrolytic process, samples were collected at 0, 30, 60, 120 y 240 min and immediately heated at 100°C for 15 min for CPs inactivation. Finally, samples were set on an ice-water bath for cooling and prepared for SDS-PAGE analysis. For this analysis, hydrolyzed fish samples were solubilized in 9 volumes (w/v) of 5.0% SDS solution (containing 0.1% 2-mercaptoetanol) and heated at 80°C for 15 min using a shaking water bath. Then, samples were centrifuged at 5000 × g for 15 min at room temperature (25°C). SDS-PAGE analysis was performed by the method of Laemmli  following the procedure described by Shamloo , using a 15% polyacrylamide separation gel. Citrus flower extracts have proteases active in a broad pH range indicating the presence of different types of proteases. Citrus proteases (CPs) are able to degrade different proteins substrates at different extent . The total proteolytic activity in CPs extract using different protein substrate and pH conditions is shown in Table 1, supporting that protein activity depends of protein substrate and pH conditions evaluated. In order to evaluate the potential use of CPs extract for fish hydrolysate production, fish tilapia muscle was subjected to hydrolysis at different conditions. As shown in Figure 1, gradual muscle protein degradation was observed as incubation time increased. How it was expected, increasing the enzyme concentration (from 2.5 to 5%) a higher protein degradation was observed. The concentration and type of protease used determine the extent of hydrolysis as well as the characteristics of the peptides produced. Unspecific proteolytic activity would yield short peptides fragments that may affect negatively in some functional properties of the hydrolysates produced . However, some small peptides can display certain biological properties that can show beneficial effects in consumer health, enabling their use in areas such as medicine and food industry [9,14]. In the present study, different protein degradation patterns were observed between samples incubated with CPs at different pH. At acidic conditions (pH 4.0) a broad protein degradation pattern was observed for major fish muscle proteins, indicating that CPs were highly proteolytic at this condition (Figures 1A and D). A high proteolytic activity for CPs at pH 4 was previously reported . At this condition, CPs released low molecular weight protein fragments below 10 kDa (observed as a smearing area in the SDS-PAGE) belonging to the degradation of most muscle proteins (Figures 1A and D). The presence of bioactive peptides sequences in different protein sources has increased the interest for their release by an enzymatic process and their use in the design of novel functional foods due to their beneficial effects in health problems such as hypertension, obesity, diabetes, cancer etc. [9,15]. Therefore, in the present study, the presence of small peptides fragments observed in the fish muscle hydrolysate produced at pH 4, would represent and option for the production of bioactive peptides. However, their evaluation for bioactive properties need further investigation. *One unit of proteolytic activity (U) correspond to the amount of protein that increased the absorbance by one unit under assay conditions. Table 1: Effect of protein substrates on proteolytic activity of raw citrus flower protease (CPs) Extract. 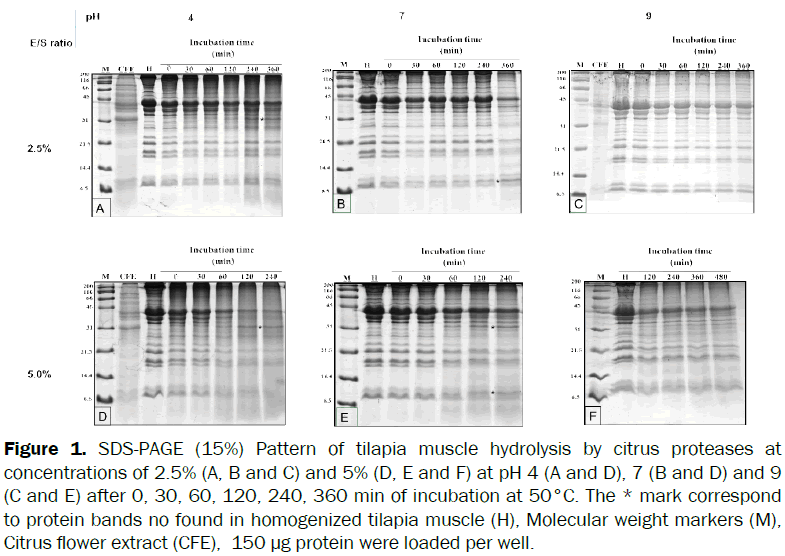 Figure 1: SDS-PAGE (15%) Pattern of tilapia muscle hydrolysis by citrus proteases at concentrations of 2.5% (A, B and C) and 5% (D, E and F) at pH 4 (A and D), 7 (B and D) and 9 (C and E) after 0, 30, 60, 120, 240, 360 min of incubation at 50°C. The * mark correspond to protein bands no found in homogenized tilapia muscle (H), Molecular weight markers (M), Citrus flower extract (CFE), 150 μg protein were loaded per well. On the other side, the CPs effect over tilapia muscle proteins at neutral pH showed less proteolytic effect than pH 4. Some peptide fragments of approximately 31 kDa and 10 KDa (marked with * in Figure 1E) increased its concentration after 120 and 240 min of hydrolysis using CPs at 5% (E/S), which can be related with a specific preference for a peptide bond. This fragment presumably belong from the degradation of myosin (MW approx. 200 kDa) or actin (MW approx. 42 kDa), as both bands reduced their intensity within time. Generally, enzymes with high specificity yield fragments with similar molecular weight clearly distinguished after SDS-PAGE analysis, such as papain that cleaves near the head region of myosin molecule releasing its tail (subfragments S1 and S2, respectively) . Protein hydrolysate production is widely used to produce food ingredients with attractive properties for the food industry. The presence of large peptide fragments in hydrolysates can improve their functional properties . Therefore, the presence of large peptides on tilapia hydrolysate produced under this condition can show functional properties. At pH 9, the action of CPs over muscle proteins was also no specific (Figure 1F), however proteolysis was less intense than that obtained at pH 4.0 and 7.0 (Figures 1D and E respectively). Again, this is in accordance with the proteolytic activity previously reported for CPs, where a higher activity at pH 4.0 was observed than at neutral regions and a tendency to increase at alkaline pHs above 9.0 . Enzymatic process using selected proteolytic enzyme preparations is considered an attractive technology economically feasible to add value and for the recovery of protein from fish byproducts . The use CPs in enzymatic process would represent and attractive option for the production of fish protein hydrolysates with functional and/or bioactive properties and represent an attractive option for the replacement of traditional enzymes. Citrus protease can degrade protein substrates from different source and offer a potential for production of fish protein hydrolysates. The presence of diverse types of protease in citrus flower extract are active in a wide pH range and represent an option to replace traditional enzymes in biotechnological process such production of functional ingredients or bioactive peptides. Selection conditions for the use of CPs determine the properties of the hydrolysates produced. A limited proteolysis of fish proteins with CPs at neutral pH, would impair improved functional properties while extensive proteolysis of fish proteins observed at acid pH, released small peptides fragments which could possess bioactive properties. Authors wish to thank the National Council for Science and Technology (CONACyT) from Mexico for supporting this research. Day L. Proteins from land plants - Potential resources for human nutrition and food security, Trends in Food Science & Technology 2013; 32:25-42. Bhupathiraju SN, et al. Quantity and variety in fruit and vegetable intake and risk of coronary heart disease, American Journal of Clinical Nutrition 2013; 98:1514-1523. Pandey KB and Rizvi SI. Plant polyphenols as dietary antioxidants in human health and disease, Oxidative Medicine and Cellular Longevity 2009; 2: 270-278. Mazorra-Manzano MA, et al. Sour orange Citrus aurantiumL. flowers: A new vegetable source of milk-clotting proteases, LWT - Food Science and Technology 2013; 54: 325-330. Kumar D, et al. Microbial Proteases and Application as Laundry Detergent Additive, Research Journal of Microbiology 2008; 3: 661-672. Chalamaiah M, et al. Fish protein hydrolysates: Proximate composition, amino acid composition, antioxidant activities and applications: A review, Food Chemistry 2012; 135: 3020-3038. Pacheco-Aguilar R, et al. Functional properties of fish protein hydrolysates from Pacific whiting (Merlucciusproductus) muscle produced by a commercial protease, Food Chemistry 2008; 109:782-789. Shamloo M, et al. Biochemical properties of red tilapia (Oreochromisniloticus) protein hydrolysates, International Food Research Journal 2012; 19: 183-188. Li-Chan ECY, et al. Peptides Derived from Atlantic Salmon Skin Gelatin as Dipeptidyl-peptidase IV Inhibitors, Journal of Agricultural and Food Chemistry 2010; 60: 973-978. Kunitz M. Crystalline soybean trypsin inhibitor. II. General properties, Journal of General Physiology 1947; 30: 291-310. Laemmli UK. Cleavage of Structural Proteins during the Assembly of the Head of Bacteriophage T4, Nature 1970; 227: 680-685. Wasswa J, et al. Influence of the extent of enzymatic hydrolysis on the functional properties of protein hydrolysate from grass carp (Ctenopharyngodonidella) skin, Food Chemistry 2007; 104: 1698-1704. You L, et al. Optimization of Hydrolysis Conditions for the Production of Antioxidant Peptides from Fish Gelatin Using Response Surface Methodology, Journal of Food Science 2010;75: C582-C587. Kristinsson HG andRasco BA. Fish Protein Hydrolysates: Production, Biochemical, and Functional Properties, Critical Reviews in Food Science and Nutrition 2000; 40: 43-81.